Philippine authorities evacuated more areas on Friday and warned an estimated 5.2 million people in the path of a powerful typhoon to stay indoors, as the country braced for heavy rain and damage to infrastructure and crops. Super Typhoon Mangkhut is expected to barrel through the northernmost tip of the Philippines early on Saturday, carrying 205 kph wind speeds, and gusts of up to 255 kph, that it has maintained since it struck Micronesia earlier in the week. More than 9,000 people have been moved to temporary shelters as Mangkhut, locally known as Ompong, makes its way towards the rice- and corn-producing provinces of Cagayan and Isabela where it is forecast to make landfall at dawn on Saturday. Weather forecasters warned of destructive storm surges as high as six metres in coastal villages in the typhoon’s path. Second and third contingents of rescue teams were being prepared, in case first-responders get into trouble themselves, and disaster officials said tens of thousands more people may have to be moved. “My appeal is that we need to heed the advice of the authorities. Stay indoors,” said presidential adviser Francis Tolentino, the government’s main coordinator for disaster response. The storm picked up speed slightly on Friday and was about 450 km east of the Philippines at noon. 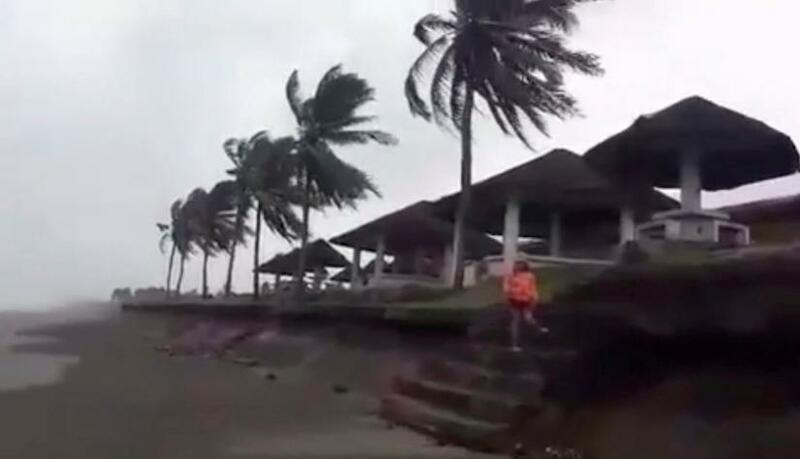 Footage posted on social media by Cagayan residents showed trees being whipped by fierce winds under dark grey skies as rain lashed down on buildings. The capital, Manila, and more than three dozen northern and central provinces have been placed under storm warning signals. Classes have been suspended and government offices shut early in more than 600 places, while military personnel, medical and emergency response teams were put on stand by. The coastguard said about 5,000 passengers were stranded at several ports by the impending storm, which will head on towards southern China and Vietnam. In the Philippines, the strongest impact could be felt in 10 provinces now under storm signal 3, a notch below the highest level. Nearly one million people in affected areas live below the poverty line. “The concerns here are landslides and infrastructure being washed away,” said Junie Cua, governor of Quirino province on the main island of Luzon. Authorities are taking extra precautions as they draw comparison with Typhoon Haiyan, which devastated central areas of the archipelago in 2013, and killed 6,300 people, many in storm surges that reached as high as eight metres. Damage to crops in a worst-case scenario could reach about 157,000 tonnes of paddy rice and about 257,000 tonnes of corn, worth 13.5 billion pesos ($250 million), the agriculture ministry said. That could result in tightness in the domestic rice supplies of rice, at a time when retail prices are already high, which would compound worries about inflation.